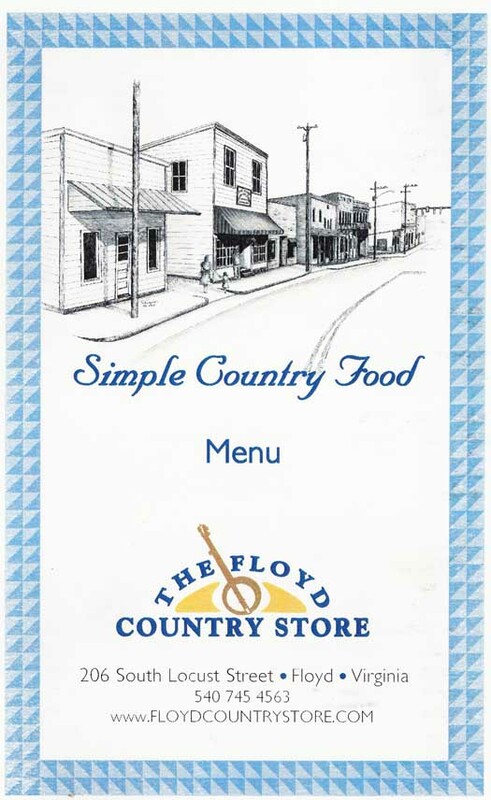 There is so much to do and see in Floyd these days that you could spend the entire day within sight of our single stoplight and you would still barely scratch the surface. After a morning spent planting Pampas Grass I took myself into town to pick up supplies, visit with friends, have some lunch and hopefully shoot photos of the afternoon’s activities. I started my day in town by visiting Wills Ridge Supply and chatting with Joe Gallimore and his friendly staff. This family-run company really makes customers feel welcome and they have always been very helpful in finding supplies for my off-the-wall projects. 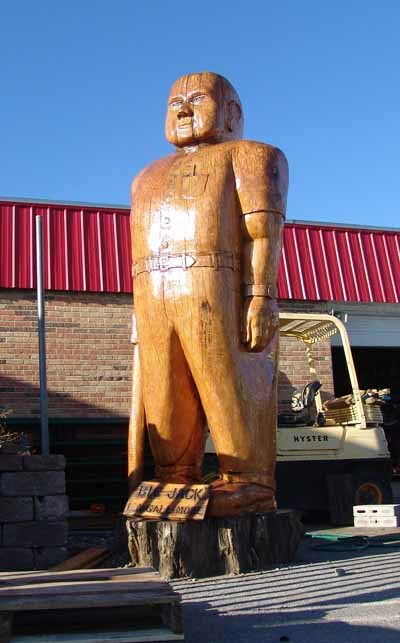 It is not every store that has a statue of the founder out in front and that deserves a post of its own in the near future. I swung by the Floyd Country Store for lunch and tried one of their new specials, a Toasted Tuna Sandwich. It was almost as good as my all time favorite, their Classic BLT sandwich on toasted Buttermilk bread. Those of you who know the Floyd Country Store primarily as the home of the Friday Night Jamboree would have been surprised to see the transformation they had wrought in preparing the store to host a wedding reception at 3:00pm this afternoon. The tablecloths and flowers looked very elegant in the newly redesigned Country Store. The caterer was creating magic right before my eyes and I think we will see more wedding receptions at the Store in the future. My next stop was the new gallery called Art Under the Sun, which Gretchen and five other artists are opening in the newly built-out area under the Winter Sun Theater. Today’s activity was a still life drawing demonstration and they pulled in a continuous stream of visitors. Yesterday was their first day of operation and visitors have been very appreciative so it looks like the venture has good potential for success. 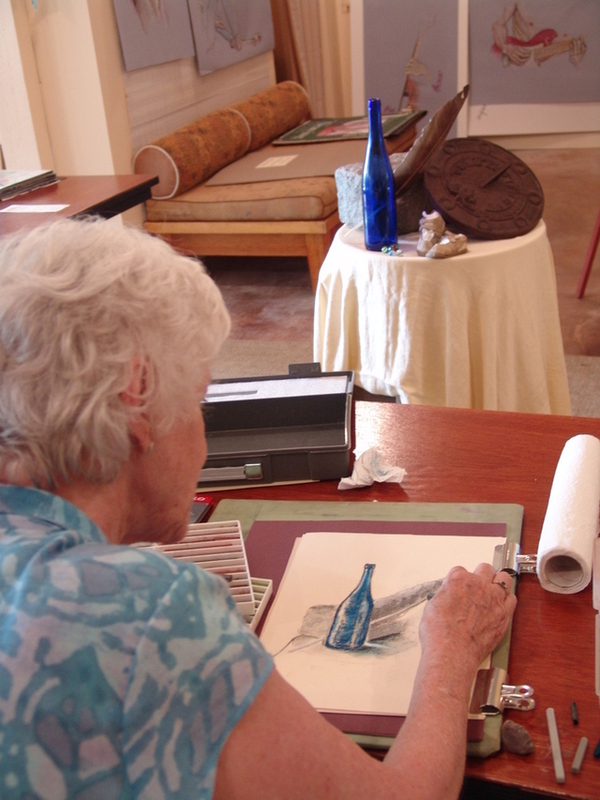 Studio One next door is operated by Marsha Paulekas and she provides art instruction for students of all ages. 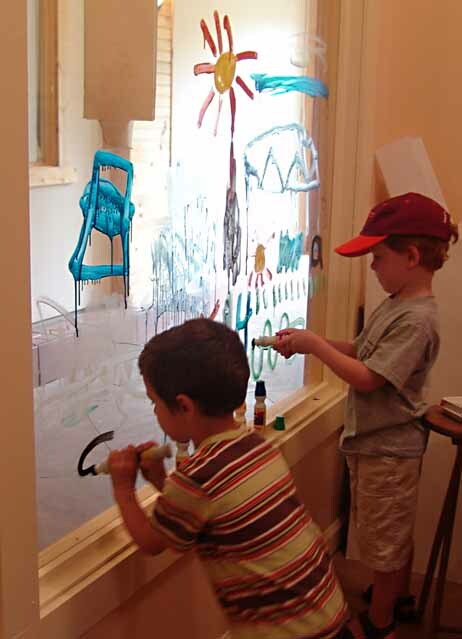 For her opening day, her studio window was set up with markers so kids could draw on the windows while their parents visited with Marsha. The kids had a ball and so did I trying to capture their excitement. Marsha says, don’t try this at home. Washing the window was an interesting experience as it included washing the wall and the floor too. 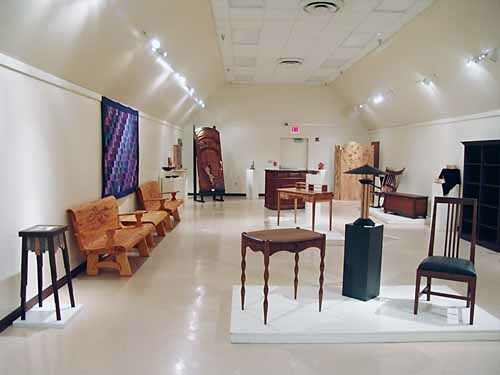 The Jacksonville Center had two classes running and a fine woodworking and furniture exhibit in the Hayloft Gallery. 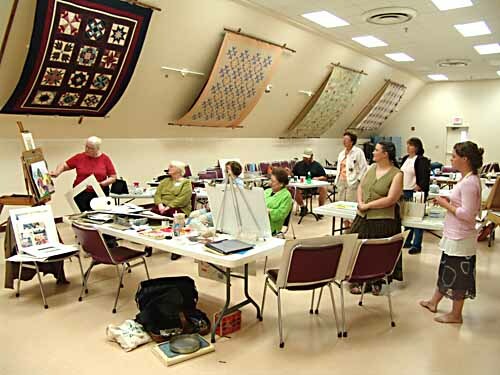 Sue Pollins was offering a Watermedia Workshop for Intermediate painters or adventurous beginners. The class was full and students were being encouraged to extend themselves. Judging by their high spirits, the students were enjoying the challenge. Out in the blacksmith shop, Sue’s husband John Pollins III was instructing a good sized class of young and old blacksmith students in the fine points of Pretty and Functional Blacksmithing. It appears to be an exhilarating experience to heat metal to a red glow in a fire and then shape it to your will with hammer and tongs. 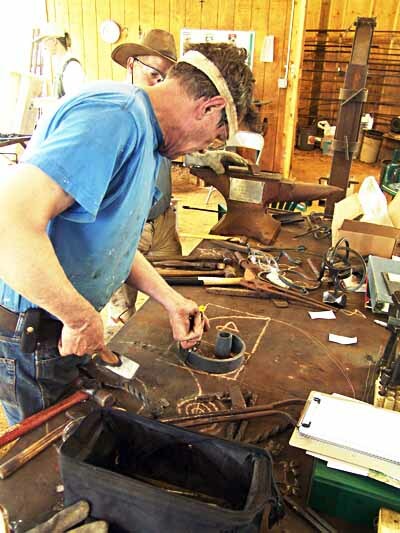 It is probably some kind of racial memory that is passed down with our genes, because I have never seen such pure joy in a students eyes as in the blacksmithing classes. Both men and women students enjoy these courses. My last stop was the Hayloft Gallery at the Jacksonville Center where some masterful woodwork was on display. 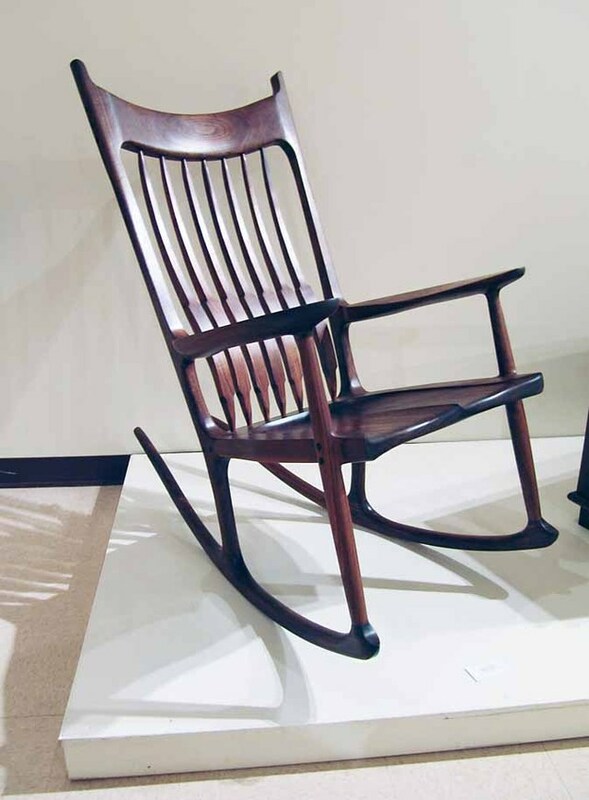 A rocking chair based on a Sam Maloof design, a carved and stained door, and an incredible backgammon table were just a few of the elegant designs to be seen. This exhibition will run until July 28th so you should have time to drop by and see it. On my way home I passed the Winter Sun where they were in the final stages of setting up for Grace Potter and the Nocturnals, a Hammond B-3 organ-fueled blues-rock quartet from Vermont who play a spirited and inventive blend of blues, Americana and rock n’ roll. I would have liked to heard them but it was time to leave and get some more work done. UPDATE: For my out of town readers, here is a Google map of the places I visited today. So this was a quick snapshot of a Saturday in Floyd. There are more things to do than time to do them and there are so many activities that five bloggers could barely cover them all. I took 650 photographs this weekend along with 5 or ten video clips. Most go to the groups whose activities I document and I keep a few to illustrate these articles. I can easily envision a future where 85% of your local news will come hot and smoking from the keyboards of neighborhood writers. There are a lot of really appealing stories that never see the light of day because of the limitations of newsprint and broadcast time. If every neighborhood had its own blogger, there would be very little that would go unremarked. Right now blogging is a pioneering activity and we change the rules every month. If any of you would like encouragement to start blogging, I will be glad to help you out. If we could use several more bloggers in Floyd, how many bloggers do you think your community could use? I think you would be surprised. This entry was posted in Seen around Floyd, Weblog as Power Tool and tagged Art Under the Sun, Big Jack Gallimore, Blacksmithing, Floyd Country Store, Floyd Virginia, Joe Gallimore, The Jacksonville Center, Watercolors. Bookmark the permalink. I am so glad that I found your blog site a few months ago now. I read it regularly and thoroughly enjoy it. We make our big move 6/24 back to Floyd. I would be weary about the transition from NY Metro area to Floyd for my young girls. Your snap shots of Floyd though, reconfirm my decision to move back to Floyd everytime I visit. Floyd has so many cultural, educational, community events, that it really could rival any other idealic place to relocate to. Thank you!